SAN DIEGO--(BUSINESS WIRE)--Apr. 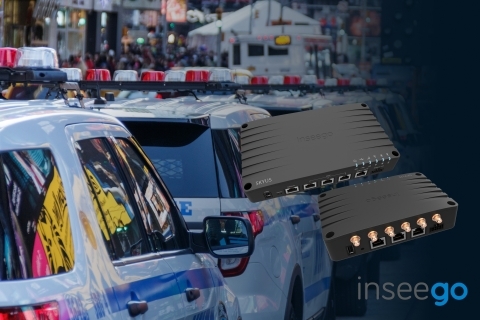 2, 2019-- Inseego Corp. (Nasdaq: INSG), a pioneer in 5G and intelligent IoT device-to-cloud solutions, today announced the latest additions to its Skyus industrial IoT (IIoT) portfolio – the ruggedized Skyus™ 300 and Skyus 500 gigabit edge routers, powered by MiFi iQ technology. Both are purpose-built to futureproof and simplify complex deployments while lowering the total cost of connecting critical remote and mobile assets for industrial, public safety, transportation and infrastructure applications. Skyus 300 and Skyus 500 are the only full-featured IIoT routers that deliversecure and reliable LTE Advanced Pro (LTE-A Pro) peak speeds of up to 1.2 Gbps in a rugged design that conforms with IP64 and MIL-STD 810G military-grade specifications. Inseego’s latest additions to the Skyus product family give customers the flexibility to choose the solution best suited for their needs: The full featured Skyus 500 for high performance use cases, such as in-vehicle connectivity; and the configurable Skyus 300—one of the industry’s most compact routers for applications with tight space constraints, such as outdoor kiosks or remote infrastructure enclosures. State-of-the-art 4x4 MIMO 5 Carrier Aggregation, 256 QAM, and support for a wide range of spectrum bands, including Citizen Broadband Radio Service (CBRS) band and License Assisted Access (LAA) 2x2 MIMO. This combination maximizes signal reception for increased throughput and last mile connectivity, which is ideal for high throughput connected enterprises and industrial applications in remote areas at the very edge of cellular network coverage. Commercial availability of the Skyus 500 begins in April 2019 and commercial availability of the Skyus 300 begins in May 2019. For more information about the Skyus 300 and 500 series, visit https://www.inseego.com/skyus-300-500/. Media Only: For more information on Inseego’s solutions, and/or to schedule an interview with Inseego executives, please email inseego@goDRIVEN360.com. ©2019. Inseego Corp. All rights reserved. The Inseego name and logo are trademarks of Inseego Corp. Other Company, product or service names mentioned herein are the trademarks of their respective owners.